It’s tempting to try to save money by representing yourself in a real estate transaction, but it really isn’t worth it. Here are six reasons you should use a REALTOR®. 1. Your REALTOR® can help you understand different financing options and identify qualified lenders. You really shouldn’t begin a home search without having been prequalified. Your REALTOR® has relationships with several wonderful loan officers – allowing you to narrow your search for lending and getting you to be able to buy much sooner. 2. Your REALTOR® has many resources not available to the general public to assist you in your home search. Yes, anyone can put a listing on Zillow, but REALTORS® have access to hundreds of home search sites via their Multiple Listing Service (MLS). The MLS is often the first place potential home buyers and their real estate agents discover property. Plus your REALTOR® has the experience to know the best features to highlight to bring in the best pool of buyers. The other cool thing about REALTORS® is they often hear about properties first before they are noticed by the general public. This is especially important in a seller’s market because the buyer has an inside edge to put in an offer before the rest of the buyer pool takes notice. Your REALTOR® will find great properties that meet your family’s needs and budget – plus they will have access to information about the property including closing cost assistance, decorating allowances, or any potential tax liens that could delay closing. Having a professional weed out the properties that are likely not going to work will help you focus on finding the properties that do. There are a myriad of negotiating factors, including but not limited to price, financing, terms, date of possession, and often the inclusion or exclusion of repairs and furnishings or equipment. The purchase agreement should provide a period of time for you to complete appropriate inspections and investigations of the property before you are bound to complete the purchase. 5. 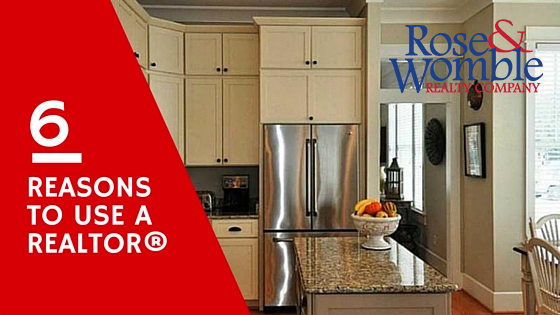 Your REALTOR® will help arrange necessary inspections. Depending on the area and property, you could need inspections for termites, dry rot, asbestos, faulty structure, roof condition, septic tank and well tests, just to name a few. Your REALTOR® can assist you in finding the qualified professionals to do these investigations and provide you with written reports. 6. Your REALTOR® will guide your through the closing process. From how title conveys, to the final walk through, having your REALTOR® by your side is a great benefit because at the last minute a challenge may pop up. Your REALTOR® will have the experience and the knowledge to handle that.